You think infinite scroll is cool? Search-friendly infinite scroll is even cooler! We just announced on the Webmaster Central Blog how to make infinite scroll pages more search-friendly, helping search engines access all the individual items in the category/gallery so the content is available in search results. 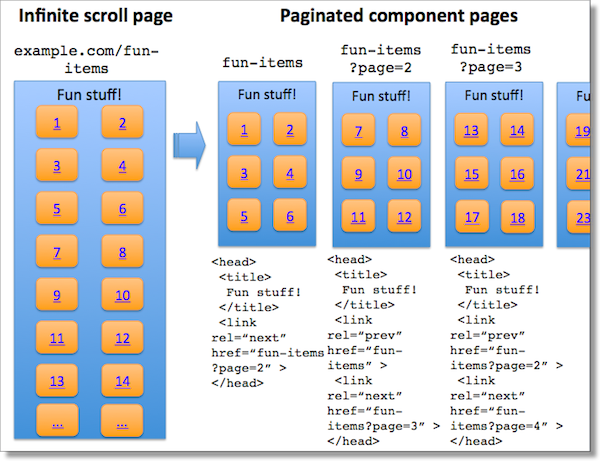 Infinite scroll page is made “search-friendly” when converted to a paginated series. Each component page has a similar <title> with rel=next/prev values declared in the <head>. Coverage: All individual items are accessible. With traditional infinite scroll, individual items displayed after the initial page load aren’t discoverable to crawlers. No overlap: Each item is listed only once in the paginated series (that is, no duplication of items). For the full details, check out our new post on the Webmaster Central blog. John Mueller is a Webmaster Trends Analyst in Zurich, working with webmasters and Google engineers to make the web better. In his time off, he builds robots with his kids to take over the world (or at least mow the lawn).